With over 100 employees in four separate locations, MFI is Vancouver Island’s largest independent insurance firm. They rely on Smart Dolphins to manage their day-to-day IT operations and support their growing business. Increasing downtime, reduced productivity and potential security risks led BCACC to seek out a cost-effective IT overhaul. Learn how BCACC ushered in a new era of IT leadership by improving their IT infrastructure with Smart Dolphins managed IT. With more than 18 busy lawyers and many more supporting staff, Pearlman Lindholm, one of Victoria’s most progressive law firms, partnered with Smart Dolphins to reduce their IT costs, renew their IT infrastructure and increase the firm’s profitability. ICA’s rapid expansion generated a renewed investment in IT. Increased efficiency combined with predictable IT costs helps this non-profit focus on their mission: delivering support services to thousands of Island immigrants and refugees. 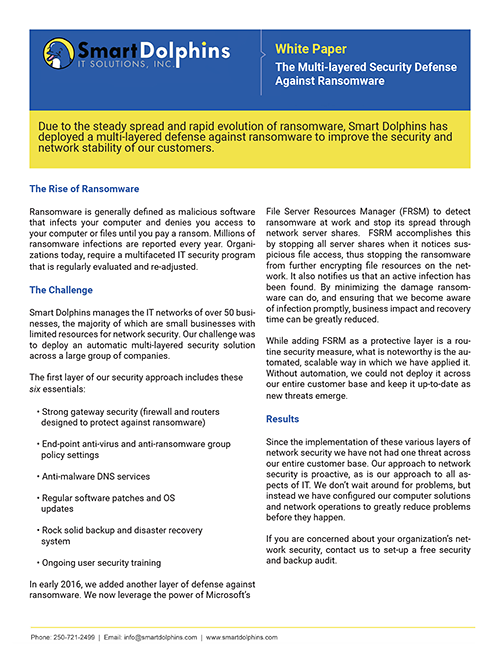 Due to the steady spread and rapid evolution of ransomware, Smart Dolphins has deployed a multi-layered defense against ransomware to improve the security and stability of our client’s network. In this e-book, we bring to light numerous considerations that are all-too-often overlooked when organizations are deciding between in-house and outsourced IT. assessment tool to help you identify potential vulnerabilities. You’ll find out how your organization fares when it comes to the overall state of your network security. Be the first to read our case studies. Or, are you ready to meet a Dolphin in person? Contact us!